"a good dose of proper fun"
After the recent revivals of Half a Sixpence and 42nd Street, the West End’s musical options all seem a bit too safe and a bit too polished. 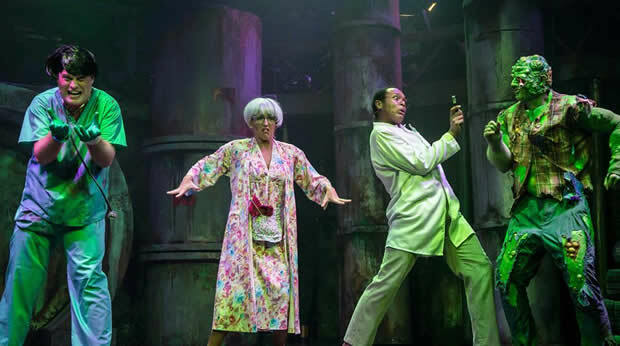 That is, until Joe DiPietro and David Bryan's hulk of a musical The Toxic Avenger smashed into London, at the perfectly shabby Arts Theatre, bringing haphazard comedy, hilarious slapstick and a good dose of proper fun. Previously seen by sold-out audiences at the Southwark Playhouse last year, before enjoying a five-star run at the Edinburgh Fringe, this anarchic, off-the-wall musical comedy returns at a time when Mel Brooks' Young Frankenstein has set up shop just down the road at the Garrick. It's great to have two adapted cult screen classics on stage, opening doors to audiences who may not want to see tonnes of tapping feet at the Drury Lane. Based on the 1984 film of the same name, The Toxic Avenger sees the fate of a beyond-polluted New Jersey lie in the hands of resident geek, Melvin Ferd the Third. Desperate to win the love of a blind librarian, he takes on the evil Mayor, only to be disposed of in a vat of toxic gunk that transforms him into super-powered mutant, Toxie. Sounds average, right? What makes The Toxic Avenger so, well, intoxicating, is the sheer amount of talent packed into the tiny cast of five. Mark Anderson is charming as Toxie, showcasing a voice like honey, whilst Natalie Hope gives a hugely impressive turn as the Mayor and Ma Ferd, singing with incredible aplomb and a voice that shakes the rafters. Emma Salvo is gut-bustingly hilarious as blind girl and love interest Sarah, particularly in musical numbers such as “My Big French Boyfriend” and “Hot Toxic Love”, which are delivered with gusto, powerhouse vocals and wicked comic timing. Oscar Conlon-Morrey and Ché Francis give brilliantly solid support as, well, everyone else, with too many costume changes to count on one hand. It's the chaotic, anarchic nature of this musical that makes it such a success. Benji Sperring's direction ensures that the small cast fill up the stage in an incredibly fast-paced show that doesn't let up. It's pant-wettingly funny too, with raucous numbers including “The Legend of the Toxic Avenger”, “Evil is Hot” and “All Men Are Freaks”. At a time when the world is at odds with itself, it's exactly this kind of escapist silliness that we need. With a wickedly talented cast, The Toxic Avenger is one of the must-sees of the season, providing the perfect antidote to a world that's already incredibly polluted. 2 October 2017 - "a good dose of proper fun"